It seems everyone is joining in on the recent Pokemon Go craze. The game, which is as close to a real life adaptation of the Pokemon world as anyone could hope for, is played outside using your phone to track down Pokemon and battle other members of the community for ownership of Pokemon gyms. This has sparked a cultural phenomenon bordering on obsession. The negatives of the game are a little scary, however, and I’ve noticed some bad habits which include people not being aware of their surroundings as they play, despite the game explicitly warning you to do so, people driving while playing, and in some instances bad people using the game to lure in unsuspecting patrons to rob them or worse. Does placing a Pokemon character on a private property, without permission, affect the owner’s interest in exclusive possession of the property? Does it create an attractive nuisance? Does owning real property extend property rights to intellectual property elements that are placed on it? Is there liability for placing the characters on private property or in dangerous locations? Michigan lawyer Brian Wassom raises other legal issues in a post for the Hollywood Reporter’s THR, Esq. blog. Augmented reality games can lead to competition for the use of the same physical spaces, disrupting the ability of players and non-players to enjoy the place, and possibly leading to violence, he says. Could government limit the players in a public space? Would that bring a First Amendment challenge? Wassom also sees a risk of injury for players who are “wandering through the physical world while staring through a phone screen.” New York lawyer Peter Pullano makes a similar point in an interview with 13WHAM in which he raises the possibility of distractions for drivers. “Even though you may be looking for your Pikachu while you’re driving, that’s not going to impress your officer,” Pullano said. LawNewz points out that the game’s terms of service disclaim liability for property damage, personal injury or death while playing the game, as well as claims based on violation of any other applicable law. The game also has a notice that generally requires arbitration of disputes. 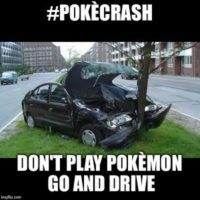 My #1 Tip For Staying Safe While Playing Pokemon Go: DO NOT PLAY WHILE DRIVING!!! This is as dangerous, if not more dangerous than texting and driving. Again, I don’t want you to end up in a car accident because you do a U-Turn and jump over a median to catch a Pidgeotto. I promise you there will be another chance to catch one that doesn’t involve you risking you being in an accident. Stay safe out there friends! !